2018 will be an exciting year as GMA Network will air GMA ONE Online Exclusives. Atom Araullo starts anew with "Adulting" featuring common yuppies' issues that many can relate, Gabbi Garcia will teach makeup tutorials and more with #Goals and Joseph Morong will educate us all with "Fact Or Fake". We met the three hosts of their individual shows airing Mondays at 5pm starting January 1, 2018. 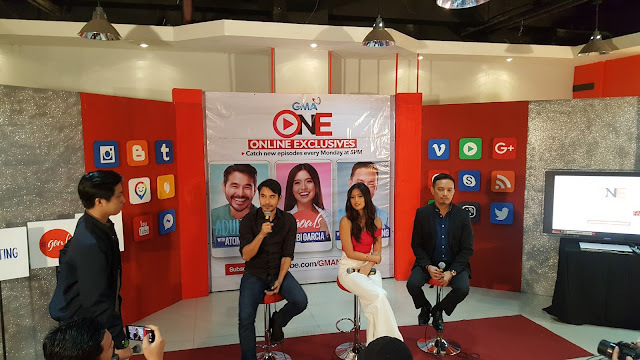 Atom shared his excitement about the first three webisodes on hacks and more about saving tips for yuppies like Gabbi Garcia's lifestyle tips and ideas while Joseph Morong's feature on how to spot fake news in all platforms.Don't miss GMA ONE Online Exclusives: “Adulting with Atom Araullo”, “#Goals with Gabbi Garcia”, and “Fact or Fake with Joseph Morong” starting January 1, via GMA Network's official YouTube account (www.youtube.com/gmanetwork) with new episodes uploaded every Monday at 5 p.m.